Finished watching the X Factor Grand Final? Then you’d be wanting to check out the brand new video to judge Guy Sebastian’s latest single ‘Don’t Worry Be Happy’, which premiered earlier tonight. We’ve all seen the photos of Guy’s plop into the harbour in the promotional videos – but that comes right at the very end in an effort to brighten someone’s day. There’s plenty to get through before that. Manky milk, a rainstorm, boring office job, crap food… But there’s a lesson in this video – and a bright as sunshine song to accompany. Guy is one of a few Australian Artists who can have the potential to do well Internationally. Receiving all this hate, only tells me we still have ”tall poppy syndrome”. What is wrong with the gay community loving Guy?? What is wrong with gay discothèques or clubs playing his music or any club for that matter. He is an Aussie artist who is giving the international artists a run for their money on the charts. You should be taking your hat off to him and not trying to tear him down with references to his arm muscles which I must say are mighty fine and your reference to gay discothèques as an insult was uncalled for Anonymous. If you had been taking notice of what Guy has been doing since “Closer to the Sun” 2004 album, you would know that he still writes killer ballads on all his albums and is able to write and perform in a variety of genres including soul, gospel, pop and dance music. He is a very versatile artist and muscian and that is why he is still in the music business in 2011 and beyond. ok, I use to love the ballad clasiic pop with spiritual lyrics he use to sing until the Closer To The Sun album, but now… his pre-made & superfluous R&B rhythm and that annoying pumpin sound accompanied by plastic lyrics (‘don’t worry be happy?? ?’ pleeease!!! someone kills me!) make me wanna tell him that he isn’t more hot or modern only because he got more muscles on his arms now or ‘coz now sings music for gay discotheques. Isn’t that the whole point Meg that Guy Sebastian creates music for his fans and they buy it and it becomes a hit. Do I smell another #1 single for Guy!! It is selling very well – it has been #2 on iTunes the last couple of days. 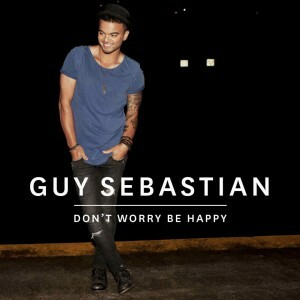 I love this song and I love Guy Sebastian because his talent is sublime! It’s yuk but it will probably still sell well. His fans will see to that.